New Price! CARFAX ONE OWNER NO ACCIDENTS, BLUETOOTH, FULLY INSPECTED AND DETAILED, LT Package, 4-Wheel Antilock Disc Brakes, ABS brakes, Compass, Electronic Stability Control, Enhanced Driver Alert Package, Forward Collision Alert, Front dual zone A/C, Fully automatic headlights, Heated door mirrors, Heated Front Reclining Bucket Seats, Heated front seats, Illuminated entry, Intellibeam Headlamps w/Automatic High Beam On/Off, Lane Keep Assist w/Lane Departure Warning, Leather-Appointed Seat Trim, Leather-Wrapped Steering Wheel, Low Speed Forward Automatic Braking, Low tire pressure warning, Power Liftgate, Power-Adjustable Accelerator & Brake Pedals, Premium Smooth Ride Suspension Package, Remote keyless entry, Safety Alert Seat, Traction control. CARFAX One-Owner. Clean CARFAX. 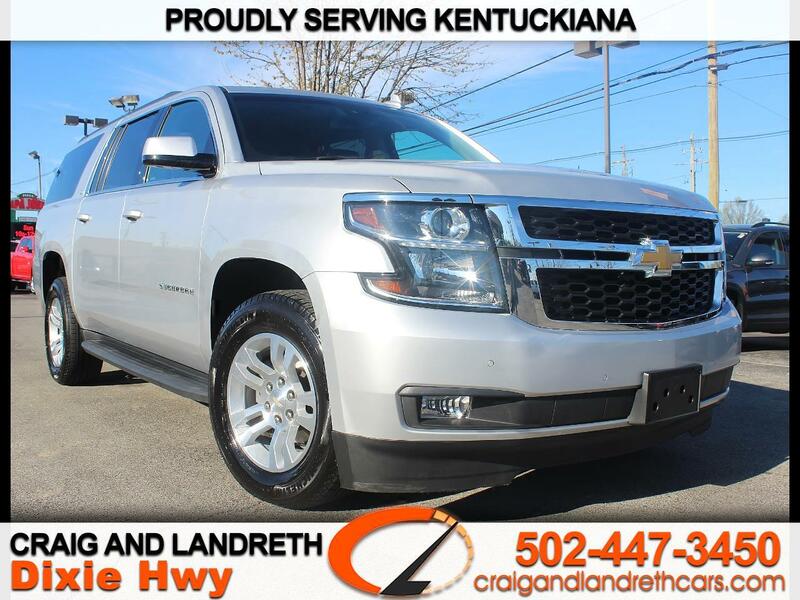 Silver Ice Metallic 4WD 2018 Chevrolet Suburban LT V8 Odometer is 11921 miles below market average! Proudly serving Kentuckiana for over 40 years with an A+ BBB Rating! Having 7 convenient locations and over 800 vehicles, we're sure to have the right car at the right price! Inquire to schedule your VIP test drive today. All prices plus tax, title, lic, and dealer processing fee.